Preheat the oven to 350°F. Bring a large saucepan of water to a boil. Cut off and discard the woody ends from the asparagus and boil the spears for 5 minutes, or until fork- tender but still firm. Drain, transfer to a dish, and sprinkle the lemon juice on top. Heat a wide 3-quart saucepan of water over medium heat and add a pinch of salt. Poach the eggs. Place the English muffins on a baking sheet lined with parchment paper. Top each muffins half with 3 asparagus spears and 2 slices of Brie. Bake for 5 minutes, or until the cheese is melted and bubbling. 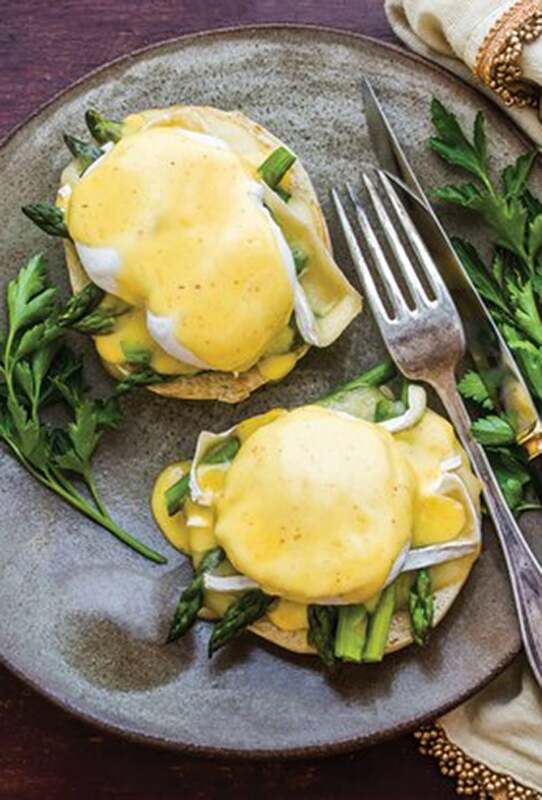 Top each muffins half with a poached egg and 1 tablespoon of the Hollandaise sauce and season with a pinch each of salt and pepper. Serve immediately. Boil vinegar, 2 tablespoons water, salt, and white pepper in a 1 1/2-quart heavy saucepan until reduced to about 2 tablespoons. Remove from heat and stir in remaining tablespoon water. Whisk in yolks, then cook over very low heat, whisking constantly, until thickened (be careful not to scramble yolks), about 1 minute. Whisk in butter 1 piece at a time, lifting pan occasionally to cool sauce and adding each piece before previous one is completely melted.